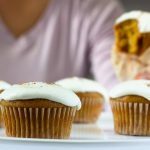 these pumpkin banana cupcakes with cream cheese frosting have caramelized banana baked in, for an extra surprise aside from the slightly spicy pumpkin cupcake and tangy cream cheese frosting. i’ve become that person who talks about the weather on her blog now. since moving back to a place where there’s seasons (no snow but a coolness floating around in the air that you don’t get in hot/hotter/unbearable southern california), it has become more noticeable. i’m more willing to treat october like it’s fall, since there’s crispy leaves and the sun sets before 6:30pm. it makes me more ready for things like chamomile tea lattes and cozy blankets and thick sweaters. 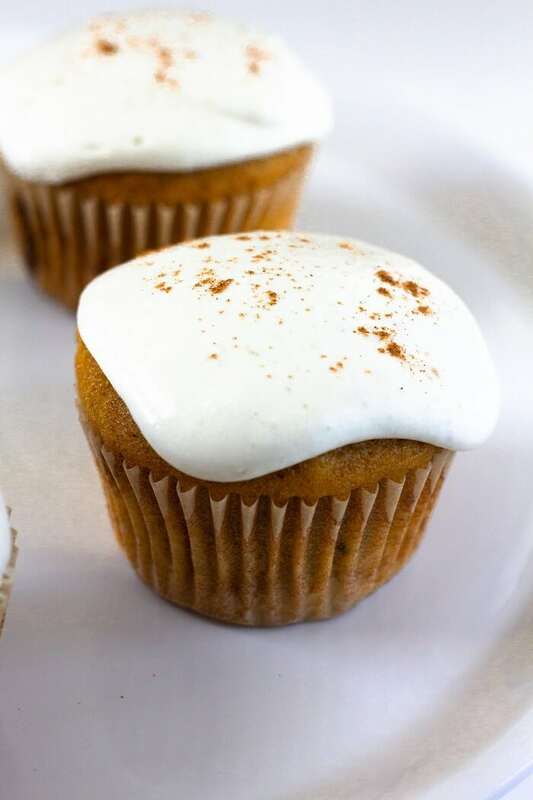 andddd these pumpkin banana cupcakes with cream cheese frosting, which are joining this year’s #virtualpumpkinparty! think pumpkin spice cake + caramelized banana + a lighter cream cheese frosting. i originally tried mixing the banana into the frosting (a la how i made the crème anglaise from this chocolate babka french toast), but working women don’t have time to strain bananas. so a little piece gets baked into each cupcake, and you get more banana flavor + you don’t have to warp your sieve. also: when i say lighter cream cheese frosting, i don’t mean healthier. think cream cheese frosting with some whipped cream folded in- it’s a little less tangy, a little less dense. i like this version as well as the more standard cream cheese frosting, so pick your poison. these cupcakes are part of this year’s virtual pumpkin party hosted by cake over steak! make sure to click through to see all the other gourd-geous treats. 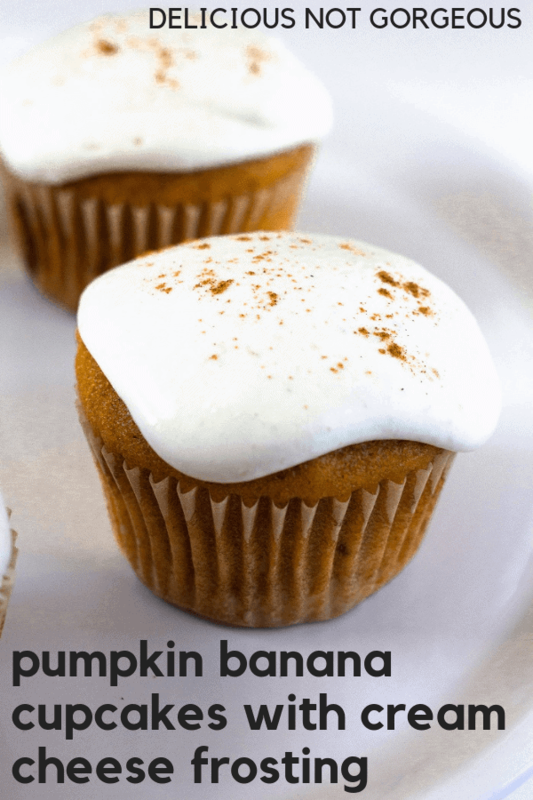 These pumpkin banana cupcakes with cream cheese frosting have caramelized banana baked into them! Beat sugar, oil and yogurt until the sugar is incorporated. Add the eggs 1 at a time. Add the pumpkin and beat until just combined. Slowly add the flour mixture, and beat until almost completely incorporated. Fold in by hand any streaks of flour. Fill 24 lined muffin wells with the batter. Bake at 350F for 10 minutes. Place a piece of banana on top of each cupcake, and sprinkle with the brown sugar. Press the banana and sugar into the batter slightly. Bake at 350F for another 10-12 minutes, or until a toothpick comes out of the cake (not the banana part) clean. Cool in pans for 5 minutes. Cool completely on wire racks. Frost cupcakes. Whip the maple syrup, cream cheese and vanilla until smooth. Add the cream 1/2 cup at a time, whipping the frosting until smooth and combined before adding the the next addition of cream. Whip until stiff peaks form. If you want a smooth look like in these pictures, dollop some frosting right in the center of the cupcake, then tap the cupcake gently against a flat surface. You won’t be able to get much frosting onto the cupcake. I’d recommend refrigerating the frosting for 3-4 hours, until a lot thicker and more spreadable. Then you can pipe and spread as you please (whereas it won’t right after you whip it). Cake adapted from CHOW, cream cheese frosting adapted from Erica Lea. Use an electric mixer if you can- it's hard to hand mix the batter evenly. I love the idea of banana along with pumpkin! This sounds so so yummy! I also think the not-as-creamcheesy frosting probably is genius with this combo! Thanks for the inspiration! i love a really rich cream cheese frosting, but this slightly whippy one is a really tasty option too! That caramelized banana sounds like a tasty surprise. Happy Pumpkin Day!! yes i love the hit of caramel-y banana in these cupcakes! These look fantastic. I like that you add whole milk yogurt in there too. Delish! thanks cindy! i love using yogurt in cake, and i never have sour cream on hand anyways. thanks kelsey! i love the flavor of caramelized bananas and it works out so well with the pumpkin. These cupcakes not only look beautiful, but I bet are super delicious. Pumpkin AND banana together sound absolutely delicious! I could so tuck into one of these right now. I love the idea of banana and pumpkin together! That frosting is just perfection. What a fun pumpkin party! yay thanks for hosting sara!! I understand how much you miss seasons. I used to live in California. It was weird going to the beach in January. But I’ve been thinking a lot about this recently. Before I started blogging, I though I was the only season-obsessed person. Like jumping on the pumpkin bandwagon. And then soon on, I realized everyone was getting to pumpkins before me! And I love pumpkin everything! And everyone talks about summer, then the transition, how they’re still hot, or they’re cold too soon. But everything about the seasons and weather affects what we cook, so now it makes total sense to me! And I have a bunch of like-minded foodies!!! so true! still eating watermelon in november because it’s so warm, but making cranberry and pumpkin goodies because of all the delicious fall things on everyone’s blogs! I don’t blame you for talking about the weather – it’s one of the most exciting things in life to talk about, ha! I love your combo of pumpkin and banana. Genius! ha yes of course (; thanks katherine! I’m loving the sound of caramelized bananas, Heather. What a fantastic idea to use them with pumpkin! And the lighter cream cheese frosting is luscious. 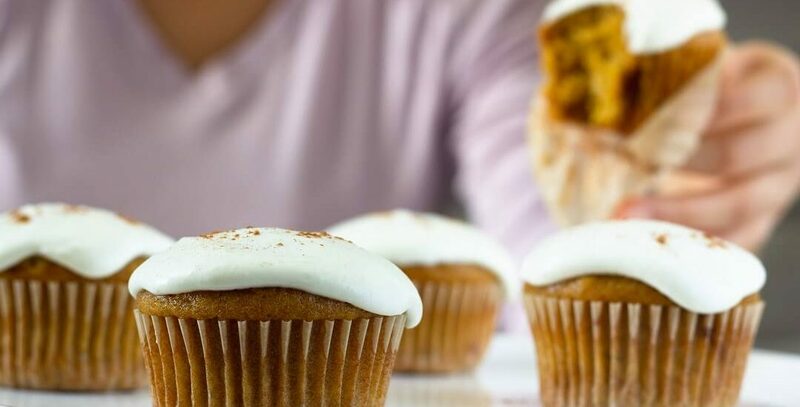 These are perfect cupcakes for fall!! 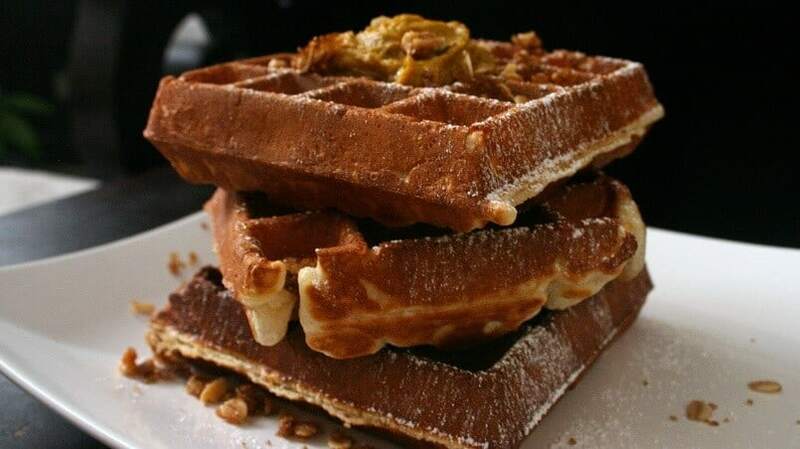 I love that you combined pumpkin and caramelized banana! And that icing looks fabulous! I love the way these look Heather! Boy do they look amazing!!! 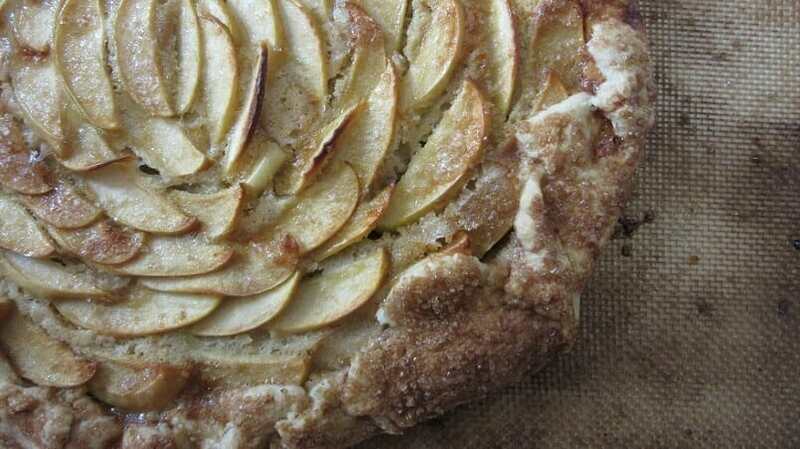 Gorgeous along with those flavors for fall!! These cupcakes sound so good, what a great combination of flavours.